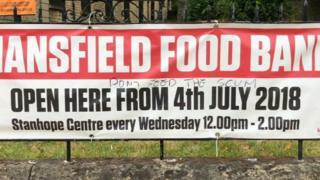 Vandals have targeted a food bank in Mansfield, scrawling "don't feed the scum" on a sign advertising the service. The message was left at Bridge Street Church along with a printed list of accusations against homeless people. The Reverend John Yarrien said he has been left upset by the abuse, but recognised people's fears. However a nearby shopkeeper claimed drug use in the area had left it resembling a "zombie triangle". The printed list was left near the Methodist church on 21 August and claimed homeless people were being sent to Mansfield as the town was "deemed friendly towards Mamba adicts [sic]". An allegation about a "very mature lady being mugged for 98p and ending up in hospital" was also made, although Nottinghamshire Police said it had no record of the crime. A local shopkeeper, who did not want to be named, said: "We've had a lot of trouble with homeless drug addicts, coming up and down, out their heads. "There was a vehicle damaged, two homeless people were having an argument... smashed the bonnet of the car and walked away like nothing had happened. "It's like the zombie triangle, you've got the soup kitchen that gives them everything there, food, clothing, you've got another one here that gives them everything... and we're in the middle of it all." Mr Yarrien said: "We were upset [about the note and graffiti] but we recognise people are feeling anxious and fearful of homelessness and drug addiction. "If we shut down the soup kitchen it's not going to get rid of homelessness, or drug taking, and associated crimes, it's just going to move those issues somewhere else." He said patrols would increase to make sure no one was taking drugs on the church grounds when the soup kitchen reopens in September. Barry Answer, from Mansfield District Council, accused the group or person behind the notice of spreading "false information". He said while Mamba was causing "unprecedented issues", not all rough sleepers were users and engaging in antisocial behaviour or crime. Mr Answer said a small group of vulnerable people had been identified as causing the most of the issues and the council was working with police and a homeless charity to tackle the problem. Regular police attendance at future soup kitchens has been agreed, he added.